3D Blood patch patch in small 2.5cm tall by 5cm wide configuration. This size can fit onto name strip, back of tactical cap, front of tactical caps or arm patches. The colours are luminous green against black. When fully charged under full light or torch, the luminous green will glow for up to 1 hour in low or no light situations. Essential for night-time emergency blood group idenfication at night or blackout conditions. Hooked side velcro backing is sewn on at all four sides for durability. 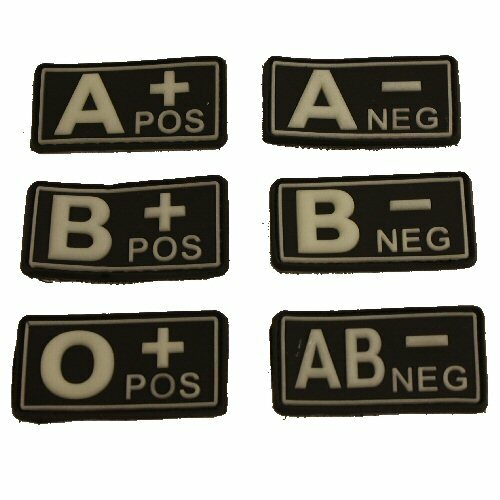 3D polymer patch allows for identification by touch and is more durable than embroidered or woven patch. Offers some resistance to abrasion. Price is for ONE patch only. Available options are: APos , BPos , OPos , ANeg , BNeg , ABNeg .